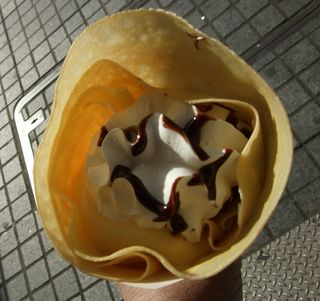 crepe houses are getting famous in making crepes with diff fillings to attract the customers. You can prepare this mouth watering dessert at home in a more economical way and ur kids will just love it. drizzling of chocolate or butterscotch. In a bowl mix all the crepe item & beat until smooth. Set the batter aside for 15 min. In a large non stick tava pour around 2 scopes of batter & make large thin crepes (like thin dosas). Once the sides start to come off take a flat spoon & loosen the crepe. Check if the bottom has browned then remove from the tava onto a board. on 1/4 side of the circular crepe put ur fruits, top it with a scope of ice cream then fold the crepe into half ,then fold the half again into to 1/4 and roll the crepe like a cone. The ice- cream will be in the centre of the crepe once folded , scope over it whipping cream and drizzle on it chocolate or butter scotch and even extra fruits & candied bits & serve immediately to individuals. what flour is to be used?? and will the crepes turn out to be crispy? What a great idea you hav com up with.Thanx for sharing this . Thank you so much for this recipe. My kids were like spending 12 s.r min for each of these as they are crazy about it and you made my day.